Maximize the performance of your EMC CX3 or CX4 series SAN. The EMC 005049158 / 005048951 / 005049032 / 005048849 / CX-4G15-450 is a 450GB 4Gb/s 15k RPM FC hard drive. All EMC hard drives sold by SPS Pros are previously used, fully-tested, and backed by a 60 day warranty against defects. The CX-4G15-450 is also known as part numbers 005049158, 005048951, 005049032, 005048849. Various EMC 450GB 15K hard drives are manufactured by Seagate with the unique part number ST3450857FC and Hitachi with the unique part number HUS156045VLF400. The EMC CLARiiON CX-4G15-450 15,000 revolutions per minute (RPM) 450 GB hard disk drives dramatically increase performance through improvements in disk operations such as rotational latency and seek rates – the factors that most directly affect access times. 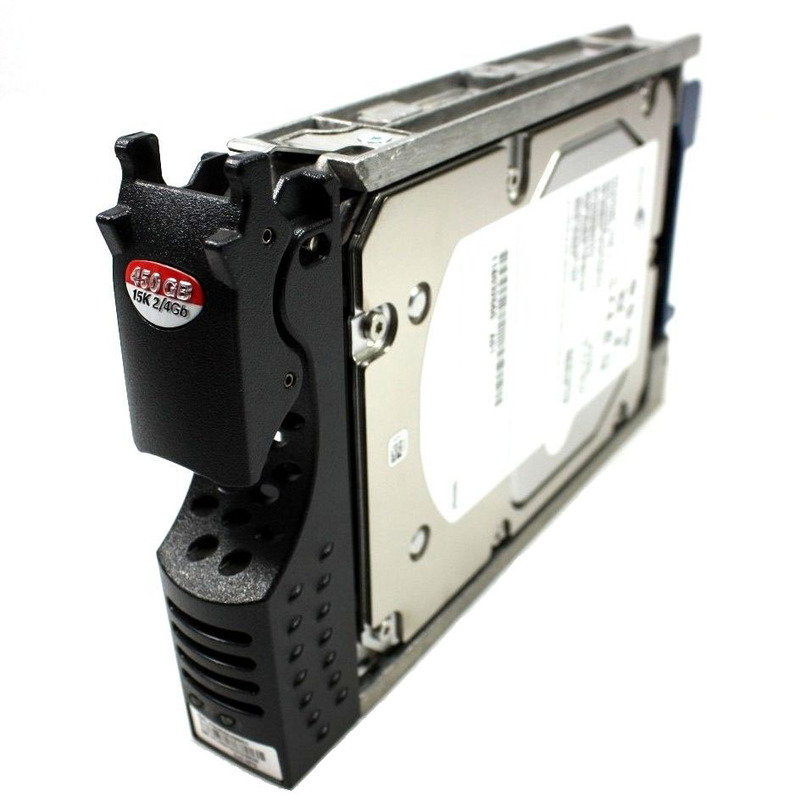 The 450 GB 15k RPM hard disk drives deliver 3.4 ms average read seek times and 2.0 ms average rotational latency times – both the fastest available for drives of these capacities available on the market. Using the 15k RPM drives such as part numbers 005049158, 005048951, 005049032, 005048849 in applications that use small block, random I/O is an important factor in realizing higher performance benefits. These applications have a tendency to minimize any caching advantages of the storage system. In addition, with applications such as these, the physical access to data on the disk has the greatest effect on overall performance. These small block, random I/O applications reap the greatest benefits from storage-system performance improvements achieved through the drive’s improved seek and rotational latency times.